Creativity has always been a part of my life and I’ve had stories brewing in my head for ages. The mid 2000s had a dark period for me and I found myself muted regarding anything creatively expressive. I was utterly miserable. However, that period passed and eraser shavings started to adorn my desk often as I worked to share my stories. The launch of this site came shortly there after and my job eventually began to slowly consume my soul (and more and more of my time). My life is by no means extraordinary. I don’t exactly have a 9 to 5 job, but I do spend an average of 50 hours per week in a company’s building that gives me money every Friday. In other words…. I have a full time job. A science-oriented college experience was mixed in before the full time job-thing happened, but the final chapter didn’t happen. An end to that story will come when ever I figure out how I want to finish it. 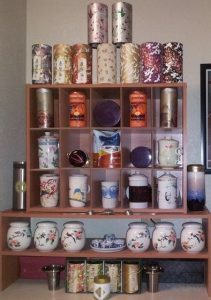 Part of my tea collection on display in the kitchen.